Gill Arbuthnott was raised in Edinburgh, studied zoology at St. Andrews University, and worked for two years as a biomedical researcher in Southampton before returning to Edinburgh to take up a teaching post at Edinburgh Academy where she teaches biology. 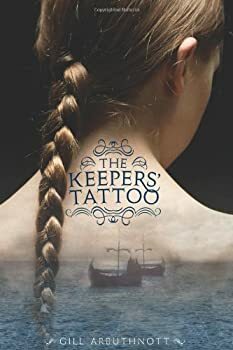 The Keepers' Tattoo, previously published as The Keepers' Daughter in the U.K., is a young adult high fantasy with historical overtones. While it is set in an imaginary world, the story revolves around the earthquake-ruined city of Thira and the highly advanced "Keepers" who once lived there. Gill Arbuthnott is clearly drawing on the real-life Thera and the mysterious Minoan culture that may have inspired the legends of Atlantis. I've long been fascinated by all things Minoan, and so I loved this aspect of the novel. Chaos Clock — (2003-2004) Ages 9-12. Publisher: Kate and David are eleven years old and best friends — playing football and doing their museum project together. But in Edinburgh, where they live, time is coming unstuck and the past is breaking loose. Old Mr Flowerdew needs their help in the war between the Lords of Chaos and the Guardians of Time, which is centered around the mysterious Millennium Clock at the Royal Museum. Can Kate use her grandmother’s golden necklace to restrain the power of Chaos, and will David be able to help the Guardians, even if it means losing his mother all over again? Winterbringers — (2005) Ages 9-12. Publisher: St Andrews, Fife — not known for its glorious weather, but even so, Josh hadn’t expected the sea to start to freeze and ice to creep up the beaches… His summer holiday isn’t looking too promising, especially as his only companions are a strange local girl, Callie, and her enormous dog Luath. Then they uncover the journal of an eighteenth-century girl who writes about a Kingdom of Summer, and suddenly they find themselves thrown headlong into a storm of witches, ice creatures, magic and the Winter King. A permanent winter threatens unless they can help restore the natural balance of the seasons. Can they stop the Winterbringers once and for all? Dark Spell — (2013) Young Adult. Publisher: 15-year-old Callie Hall has just found out she’s a witch, and things keep going wrong. Sometimes her mind seems to make things happen, things she can’t control. She can set fire to things without a match, and when she’s angry people can get hurt. Her friend Josh understands she’s a bit weird, but its only on a dark and dangerous visit to the tunnels under the ruins of St Andrews’ castle that he realises just how strange she really is. Something comes back with Callie — in Callie, something she can’t escape. Can Callie control her power long enough to send back the darkness, before it takes over her life? And will Josh ever understand her secret? A brilliant, engrossing teen fantasy from the author of Winterbringers and The Keeper’s Daughter.